Is it snowing in Valmorel ?Thank you! 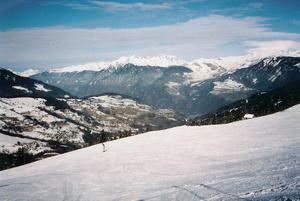 Valmorel is the main ski area in the Grand Domaine ski region that offers over 150 km of piste, from 1400 to 2100m. Valmorel is aimed at intermediate skiers, although beginners will find some nice easy runs on which to learn. Advanced skiers may not have too many runs to keep them occupied, however, there is some very good off-piste skiing, if conditions permit. The village of Valmorel is quite low but you can usually ski to the door due to the new snow cannons. In 2011 they upgraded the lift system giving easier access to the Grand Domaine. There are some great restaurants and bars both on and off the piste. Night life is OK, it is not as lively as some resorts but there are plenty of bars to quench your thirst. We stayed at Les Granges aux Fees (CGH); brand new apartments in Valmorel. Ski in/out within 10 meters of the lift with swimming pool, saunas, steam rooms and gym on ground floor. Great quality; excellent for families.